Walk around the streets of the City of London and it’s hard to miss the myriad of plaques commemorating many buildings lost in the Great Fire of London. On the Strand, however, can be found a plaque which commemorates a building that survived the fire. 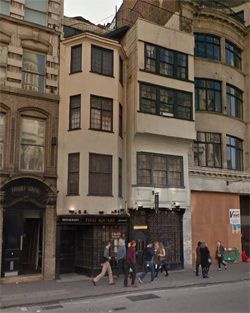 Located at 230 Strand (opposite the Royal Courts of Justice), the narrow four storey building, complete with projecting second floor, dates from 1625 and was apparently originally built as the home of the gatekeeper of Temple Bar. According to the sign upon it, the now Grade II* building was the only structure on the Strand to survive the fire of 1666. Now a rather plain-looking building, it has been much altered over the years and for much of the 20th century housed the Wig and Pen Club for journalists and lawyers – running from at least 1908, it closed in 2003. Along with the late 17th century building next door (the two are pictured above with number 230 on the right), it’s now part of a Thai restaurant.